I've been meaning to post on this paper for a long time. It's old but not ancient (2006). The authors are interesting. Collier CA is first author and does not appear to have published anything else, ever. My guess is that it was her PhD which produced the paper and she dropped out of science at this point. Anyone who has tried to get funding for their first post doc will understand. Second author is Bruce CR and he has no other publications on metformin. Smith AC has one other publication on metformin but she wasn't looking at anything interesting from the Protons point of view. Last two authors are group leaders and have virtually zero publications on metformin. So the lab dabbled in metformin for one PhD and lost either interest or funding. The paper has that feel to it. It looks preliminary, it has a few rough edges, the authors didn't appear to have known what the results were going to be before they started. Back in 2006 no one was thinking about mtG3Pdh or had any real idea of how metformin worked. One the left, metformin does nothing to suppress palmitate oxidation. No surprise there. 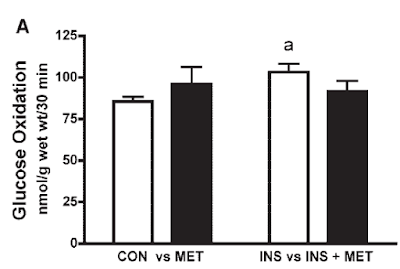 On the right, insulin suppresses fatty acid oxidation. That was one of the best findings in the paper. Never mind the lipophilic concept of obesity. Even if you keep your fatty acids outside of your adipocytes, insulin will suppress fatty acid oxidation in your soleus type muscles (i.e. an awful lot of them). Metformin stops this happening and restores fatty acid oxidation. It does this for all of the reasons in the Protons thread which I won't repeat yet again except to say that, under metformin, insulin signalling can only be facilitated by fatty acid oxidation derived FADH2, not via mtG3Pdh FADH2. Metformin alone does nothing to glucose oxidation in the absence of insulin but it blocks the small increase induced by supramaximal insulin. If you want to suppress fatty acid oxidation in your muscles, insulin does this very nicely and metformin restores it. This was the most useful finding in the paper. For whatever reason, they walked away from it. 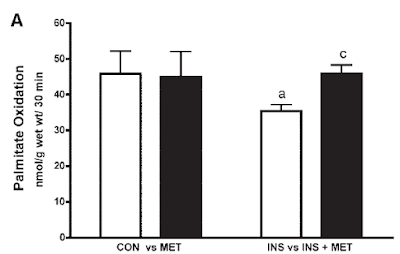 Metformin counters the insulin-induced suppression of fatty acid oxidation and stimulation of triacylglycerol storage in rodent skeletal muscle. This is very exciting. Remi forwarded it to me. He understands. We're interested in the grey line in graph A with the triangle data points. How does enforced ketosis with an exogenous acetoacetate/betahydroxybutyrate precursor (but not when using a pure beta hydroxybutyrate precursor) raise arterial pO2 from the normal of 100mmHg to the rather spectacular high of 130mmHg? The finding was unexpected. There is no obvious explanation. It needs further study. I love this. I’ll put on my anaesthetist’s hat and speculate. The rats are breathing room air and there is nothing to suggest there has been any change in minute volume of breathing following treatment with the AcAc precursor. I think the effect possibly comes down to a decrease in tissue oxygen consumption under this drug derived ketone. Aside: pO2 here is the partial pressure of oxygen in the arterial blood. This is only linked to oxygen content via the the oxygen-haemoglobin dissociation curve which is highly non linear. A change in pO2 from 100mmHg to 130mmHg is on the flat section of the curve and adds almost no oxygen carriage/delivery via haemoglobin. But it tells us things. End aside. If you have a manoeuvre which decreases tissue oxygen consumption but leaves all else unchanged you will raise the partial pressure of oxygen in the alveoli within the lungs closer to the inspired concentration. This is because less is being taken up in to the blood, so more is left in those alveoli. Arterial blood leaving the lungs (in equilibrium with the alveolar pO2) will, therefore, have a higher partial pressure of oxygen too. Equally, if you have lower oxygen consumption then the partial pressure of oxygen in the venous blood will be raised compared to normal tissue extraction, all other factors being unchanged. Again, it's because less is extracted, more is left. So there will be a higher venous oxygen partial pressure. Now, lungs are not 100% efficient. Some venous blood gets through and lowers the oxygen partial pressure in arterial blood. Higher oxygen partial pressure in venous blood means less effect on arterial blood pO2 through this lung inefficiency. These are gross simplifications. John Nunn's Applied Respiratory Physiology, chapter 10 p242 onwards, "The oxygen cascade" has a little more detail. OK, a hell of a lot more, caveats included. Especially Fig 10.7. Is this enough to explain D'Agostino's results? I don’t know. But an idea of whether I am correct would be given by taking a venous blood sample and measuring the venous pO2. The measured effect on arterial pO2 is large so you could possibly see a raised venous pO2 on a simple jugular vein sample without needing to try and get a pulmonary artery sample from a rat. That would give a “back of an envelope” assessment in little more time than it takes time to stick the sample through their blood gas analyser. Equally, just stick a rat in respiratory chamber, gavage it with the acetoacetate precursor and measure its decrease in O2 uptake. This finding has huge implications for managing any condition where oxygen delivery is compromised. Not the carotid pO2 of 130mmHg per se, this will have put very little more O2 on to haemoglobin than a pO2 of 100mmHg as stated. It's that decreased need for oxygen by the tissues which it signifies. Acetoacetate appears to allow tissues to function with a significantly reduced need for oxygen; that I find exciting. OK, I'm a bit strange but, well, that's me! Summary: People climbing Everest should be in ketosis. With acetoacetate predominating. Protons (42) Metformin as the next epilepsy drug? Some things which are written in stone are not quite as they seem. In a chat to karl about metformin/lactate in the brain I started thinking about the control of glucose derived calories being delivered to neurons. There is a general understanding that the brain does not use insulin signalling to control glucose entry to neurons, just as it doesn’t oxidise fatty acids. However we know that astrocytes certainly oxidise fatty acids to ketones and feed those ketones to the neurons, so the old chestnut about the "brain" not oxidising fatty acids is rather limited in its application. Does the same apply to glycolysis and glucose ingress? What about glial cells and insulin signalling? Insulin and IGF1 signalling pathways in human astrocytes in vitro and in vivo; characterisation, subcellular localisation and modulation of the receptors. It’s a beautiful example of massively clever people who never ask the correct question. I opened the full text and slogged through reams and reams of alphabet soup about insulin signalling in astrocytes. The group are probably planning on maintaining funding by linking modifications of this "alphabet soup" to the development of type 3 diabetes, Alzheimer’s Disease. Great plan. Of course personally I’m looking for changes in glucose metabolism related to insulin signalling. There is a sh!t load of mtG3Pdh in the mitochondria extracted from homogenised brain tissue and clearly it's doing something there. And that something, as far as I’m concerned, is related to linking glucose ingress to insulin signalling. The initiation and curtailing of insulin signalling in relationship to glucose flux. After some time spent in the mire of alphabet soup I eventually searched the paper using “glucose” to see if I was missing some deep insight amidst the said alphabet soup. Insulin binds to specific receptors and stimulates 2-deoxy-D-glucose uptake in cultured glial cells from rat brain. I would expect high levels of mtG3Pdh to be associated with very tight regulation of the glucose metabolism mediated through insulin signalling. Not in neurons. Neurons should use lactate. Glycolysis, especially the side-spur to the glycerophosphate shuttle, should be a pathway of last resort for neurons. Not so in astrocytes. They should really, really tightly control the flux of glucose through themselves as they are the guardians of the neurons. They should meter insulin signalling to control lactate generation for supply to neurons. Trying to link insulin signalling to Alzheimer’s Disease, without looking at glucose metabolism, leaves you wallowing in an alphabet soup with no way of generating a plan other than to develop some drug or other to block a downstream effect of one of those signalling molecules. Will modifying the alphabet soup, without providing normoglycaemia, help anything? Well, yes, it will help generate funding. Inhibition of Lactate Dehydrogenase to Treat Epilepsy. I've not read the text but the editorial is pretty clear about what they did. Does blockade of lactate dehydrogenase reduce seizures? Yes. But my suspicion is only if the astrocytes/glial cells are being driven hard through glycolysis either in tissue culture (at the "normal" high glucose levels used) or in mice fed crapinabag. Summary: Lactate dehydrogenase feeds lactate from glial cells to neurons. This is Good. Blocking LDH will control seizures if they are being triggered by over supply of hyperglycaemia derived lactate from astrocytes. Metformin might do the same through all of the Protons logical reasons, ie it delays/limits insulin signalling until fatty acid oxidation replaces the glycerophosphate shuttle. By which time there will be increased beta oxidation leading to glial cell ketone generation... So, metformin SHOULD limit seizures if it promotes glial cell beta oxidation to ketones and reduces excess lactate by limiting insulin signalling. That metformin lowers blood glucose would help too. Role of carnitine palmitoyltransferase I in the control of ketogenesis in primary cultures of rat astrocytes. Roles and regulation of ketogenesis in cultured astroglia and neurons under hypoxia and hypoglycemia. Metformin protects against seizures, learning and memory impairments and oxidative damage induced by pentylenetetrazole-induced kindling in mice. Labels: Protons (42) Metformin as the next epilepsy drug?